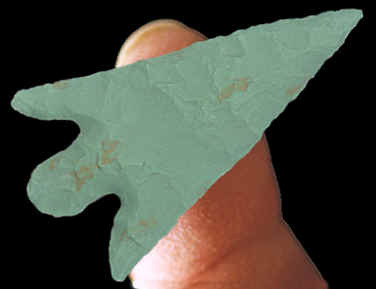 This tanged arrow point was found during one of the excavations at Wallace Ruin near Cortez, Colorado. It dates to the beginning of the Pueblo I Period during the Anasazi era sometime between A.D. 750 to A.D. 900. This point is very thin and well made. It was made from a beautiful piece of green Morrison Siltstone and it measures 1 11/16 inches (4.3 cm) long. Wallace Ruin is located near Cortez, Colorado. It's a multi-storied pueblo that has been under investigation since 1969 by Dr. Bruce Bradley. Approximately 20% of the rooms have been scientifically excavated. Wallace Ruin was a single structure that was once a part of a much larger community. The site contains two other large buildings, a reservoir, a great kiva, possible ceremonial landscaping and several small habitations. Excavations of Wallace Ruin have indicated that the structure may have served as a special function or "great house" as early as A.D. 1060. The site was still in use as late as the 13th century.